Almost a year to the day when we left way back in August 2015, we have reentered the NT and quickly reset our clocks forward an hour and a half, thank god the sun now rises at 7am not 5:30am!!!!!! 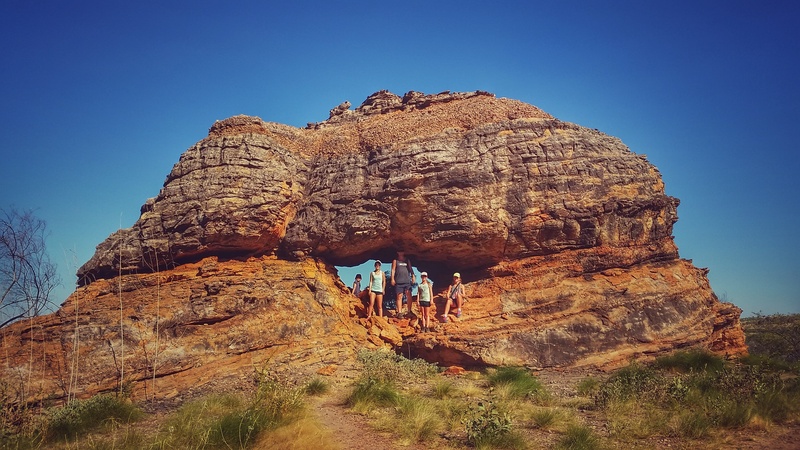 Central Australia impressed us immensely when we were there last year, so there is a bit of pressure on the ‘top end’ to live up to its reputation. We arrived at the border and took the customary shots of the sign, changed our watches and then only drove another 21kms to our next campsite in the Keep River National Park. 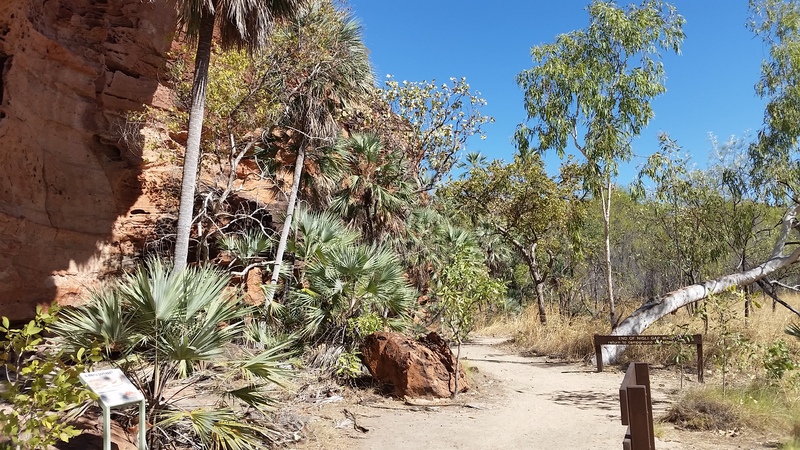 We laughed, as to travel only about 50kms it had taken us nearly 2 ½ hours…..we left at 9am WA time and arrived at 11:30am NT, just as well really as the girls told us they were ‘starving hungry’, so we had lunch. 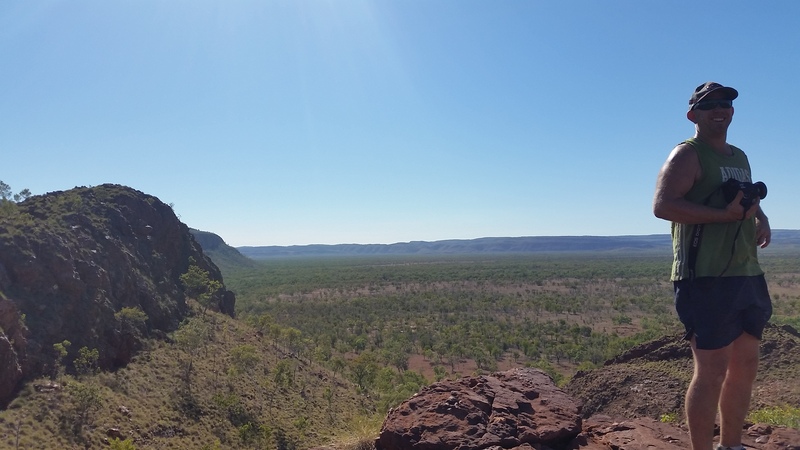 Keep River National Park is a very small national park in NT only 3kms east of the WA/ NT border and about 40km east of Kununurra. 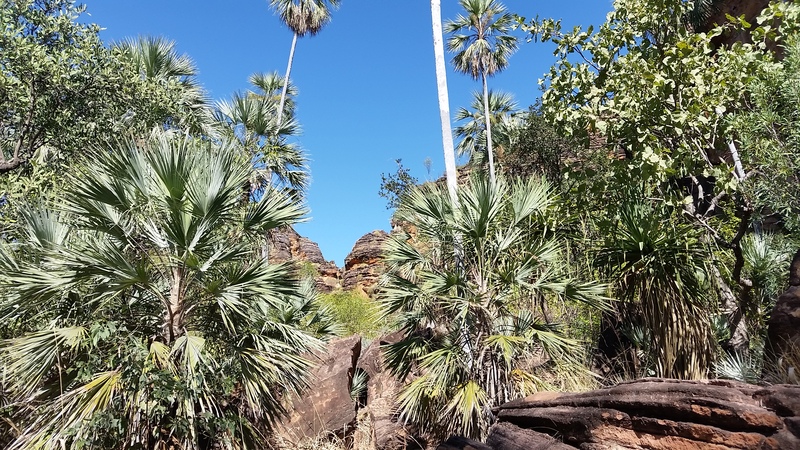 Although the park is in the NT it is very much the same landscape as the Kimberley and Mirima National Park in Kununurra, as it has the same sandstone rock formation as the Bungles. 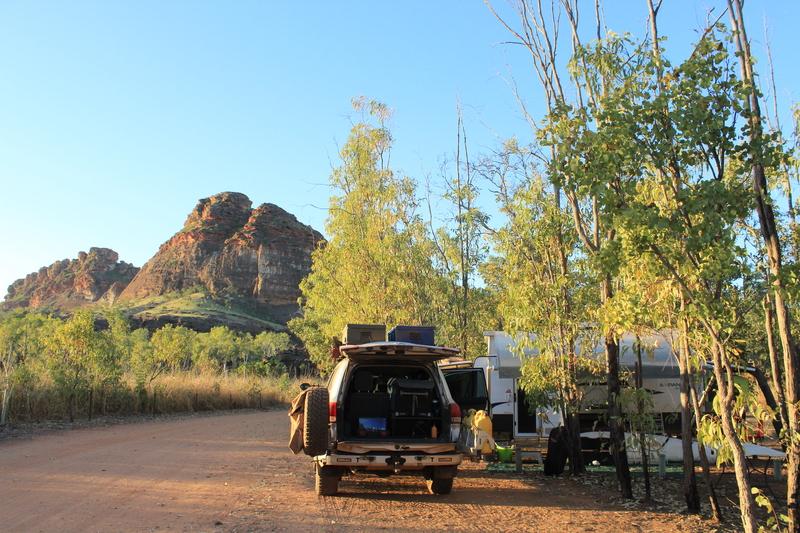 We ended up setting up camp at Gurrandalng campground, which had picnic tables, fire pits and drop toilets and some amazing scenery that can be viewed only 5 minutes walk from the van. 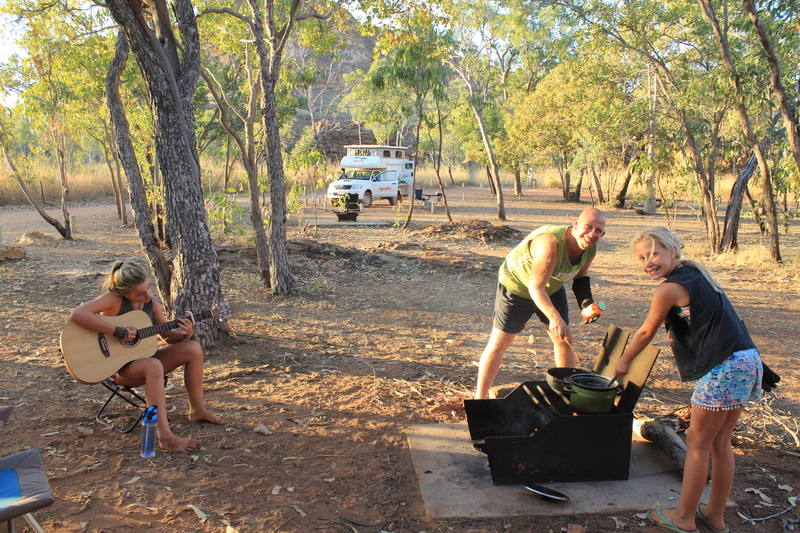 Our campsite at Keep River NP. Cooking dinner over the fire. As we had arrived just before lunch we decided to wait out the hottest part of the day and at 4:30 head out for the short 2km walk at our campground. The walk didn’t waste any time and straight away we were walking through some amazing sandstone rocks, quite like the beehive domes at Purnululu. The walk was fairly easy, although it was very hot in the sun, thankfully the afternoon shade created by the domes gave us some much needed coolness and relief. The hike near our campsite. We woke the next day as the sun was rising, it was a beautiful sight against the surrounding sandstone and one we hadn’t seen for a while (unless we got up at 5am) due to the time difference. Even though we had planned to get up early, we actually slept in to 7am, but as the kids keep telling us it was technically 5:30am…….. I must say though that it was much nicer waking up with the impending daylight and knowing that it wasn’t ridiculously early, at the other end though we didn’t eat dinner until well after 7:30!!!!! So eventually after we got ourselves organised we headed into the park a further 15km to the Jarnem campground to do the Jarnem walk. 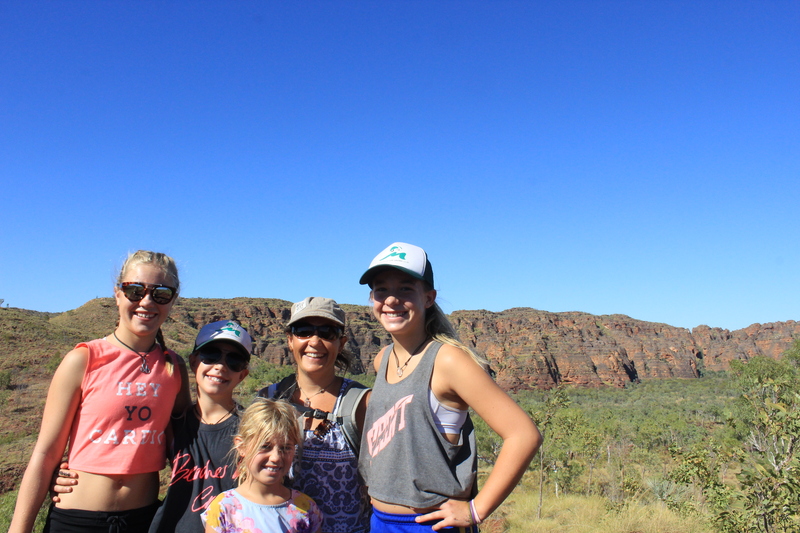 This walk was a 7km loop with shorter optional walks, however as usual we did the whole loop as we didn’t want to miss out on anything. 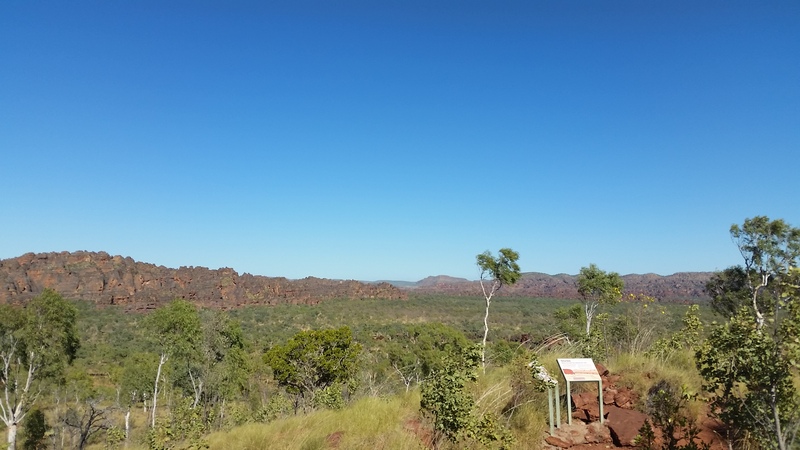 The walk first took us to the lookout then back down and along the foot of the sandstone domes to view some aboriginal art and abundance of birdlife. Whilst we couldn’t really see the birds we could certainly hear them, they were loud and everywhere as we walked through the dry water course. 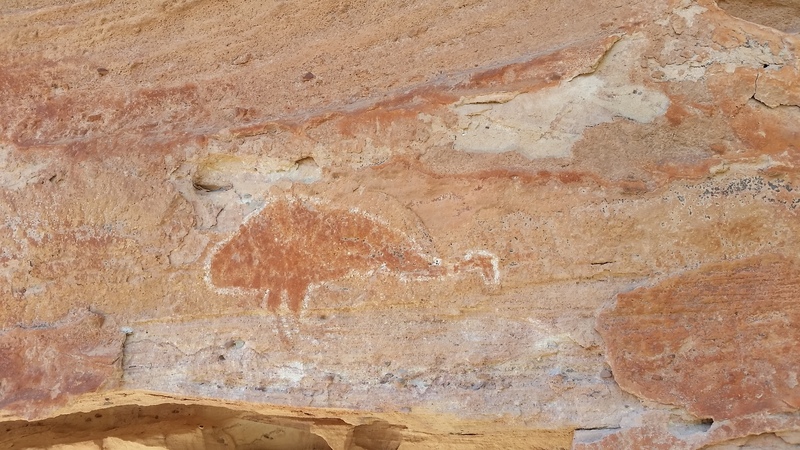 Further on we came to some rock art, some of which were very hard to spot, but the main emu drawing was impressive. Along here the scenery was beautiful, the colors of the domes together with the green tropical palms and bright blue sky were incredible, unfortunately it made me fall behind as I was busy taking photos here, there and everywhere. Aboriginal art on the walk. The rock and trees were beautiful. Nik and the girls getting sme relief from the heat. The rest of our time here we did really try and fit in with the central time zone but we were unsuccessful as we ended up having lunch at 2pm, with dinnertime and bedtime being much the same, the girls finally getting to bed well after 9pm!!! 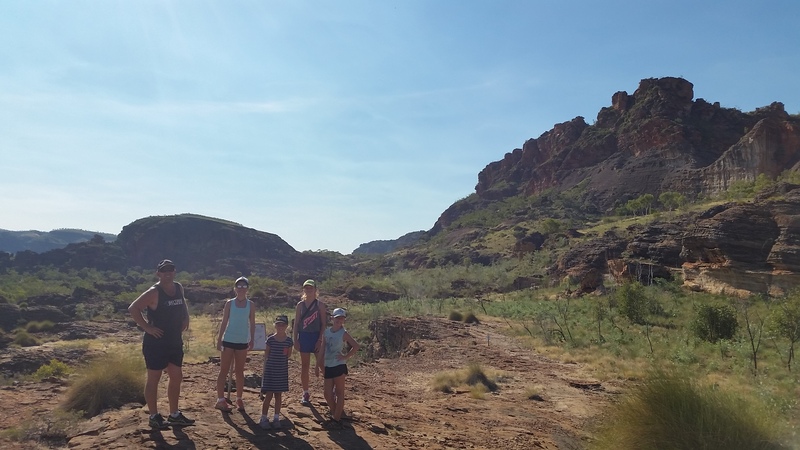 Timing aside, the Keep River National Park is an impressive park, we even voted it better than Purnululu, and were thankful that our predecessors, the Mol’s and the Leed’s families had both recommended that we stop here for a few nights on our way to Katherine. 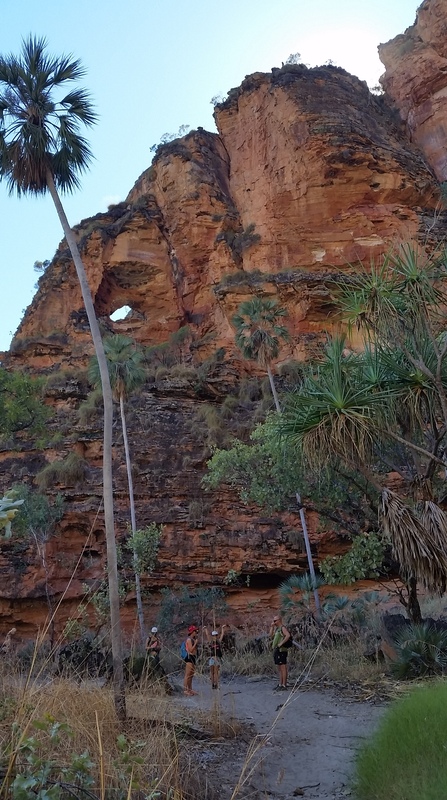 So, with much excitement, we arose the next day at god knows what time and headed off either very early, on schedule or very late towards our next adventure and destination on our OZLAP………………. 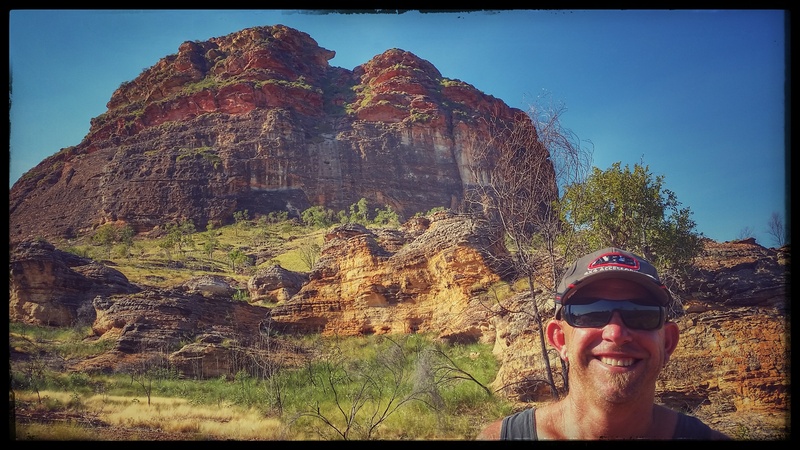 Previous Previous post: Western Australia wrap up!! !